Room / studio, in the center of Vilafranca. Studio in the center of Vilafranca, in the square of the Basilica, Wine Museum (VINSEUM) and Library Towers I Bages., In the old part of the city, with a good gastronomic offer in its surroundings, free parking less than 400 Meters. 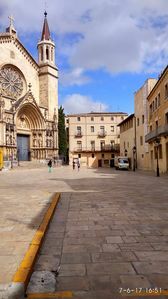 Vilafranca is the capital of Penedès, famous for its vineyards and wine making with well - known brands such as Bodegas Torres, Mascaró, Pinord, Cavas like Freixenet, Codorniu, etc. You can practice cycling or walks through the vineyards, among other activities.